The scenario: Tomorrow is farmers market day, but not just any market on any day. This market happens once a month as part of a collaboration between the Food Bank Coalition of San Luis Obispo County and Lopez High School. The high school, a continuation school in the south part of San Luis Obispo County, has a program called Hands-On Parenting Education, or HOPE, which helps expecting and parenting teenagers to graduate. It's the day prior to market day and HOPE students have a guest lecturer today: Dayna Ravalin, UCCE Master Food Preserver coordinator of San Luis Obispo/Santa Barbara counties. She's demonstrating how to make and store baby food safely. The timing is impeccable as students can (and do, as a result of the lesson) load up on fresh ingredients the very next day. Dayna takes the students through the Core Four food safety tips while demonstrating how to convert fresh market produce into baby food blocks. 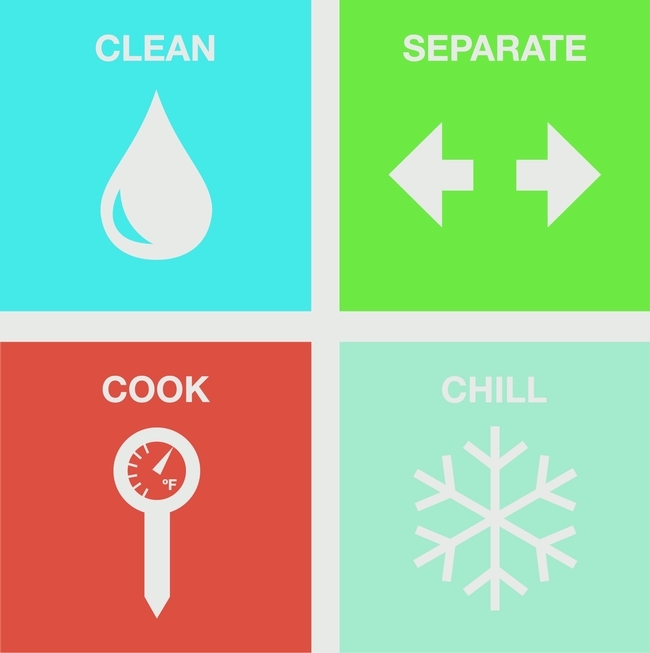 Clean - Wash hands with warm water and soap for at least 20 seconds before and after handling food. Wash cutting boards, utensils, and counter tops with hot soapy water after preparing each food item and before you go on to the next food. Separate - Don't cross contaminate. Keep raw meat and poultry apart from foods that won't be cooked. Cook - Cook to safe temperature. Chill - Chill leftovers and takeout foods within 2 hours. Keep fridge at 40°F or below. Lastly, students are shown how to easily preserve that baby food to last through the month or longer, until the next Lopez High School/Food Bank Coalition market day. 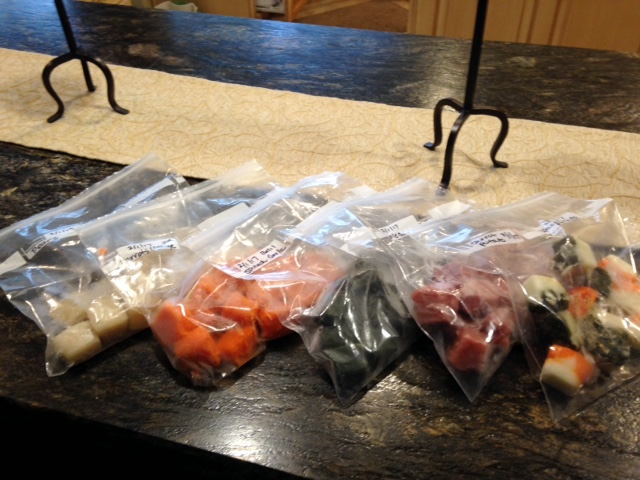 Ravalin demonstrates the use of an ice-cube tray to aide in freezing baby-sized portions before providing each student with their own tray to take home, empowering them with building blocks for healthy eating. The students leave, eager to take advantage of their resources the next day, and with two basic recipes using seasonal produce to get them started. Trim and peel carrots, cut into 1-inch segments. Put in a medium saucepan with the water. Bring to boil, reduce to a simmer, cover the pot and cook for 25 minutes (this will take longer if your carrots are thicker). Let cool in cooking liquid. Purée in a food processor, blender or food mill, cover and freeze in small portions. Add in ideas: pinch of cumin, coriander, cinnamon or mashed potatoes. Peel, halve, core and chop the apples. Put into a medium saucepan with the water or apple juice. Cover and cook over low heat for 6 to 8 minutes until really tender. Let cool in cooking liquid. Puree in a food processor, blender or food mill, cover and freeze in small portions. “You can even freeze the different purees in layers so it is triple colored when you empty the trays,” Ravalin said. Through this 1.5 hour lesson, the expecting and new parents learned how easy it can be to extend the life of food, taking advantage of the school's monthly market to provide for their families. This partnership is one example of how UC Master Food Preserver Program volunteers donate more than 20,000 hours of their time annually educating families throughout California on safe food preservation. Great story! It didn't occur to me to connect Master Food Preservers to baby food. I love how you're empowering parents to use fresh produce from the time their children are little.